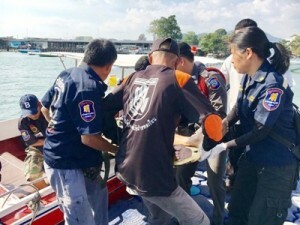 A British tourist has drowned after he got drunk and went for a swim with at a beach on Koh Samet on Sunday. The incident happened at Putsa Bay, where the 60 year old had been seen drinking with friends. Manager reports the man [name withheld] had decided to go for a swim alone but disappeared from view after 10 minutes. His friends raised the alarm and the man was pulled from the water by swimmers just after 2pm on Sunday. The man was rushed to Rayong Hospital but was pronounced dead on arrival. Police said they are confident that the alcohol in his body was the reason he drowned.